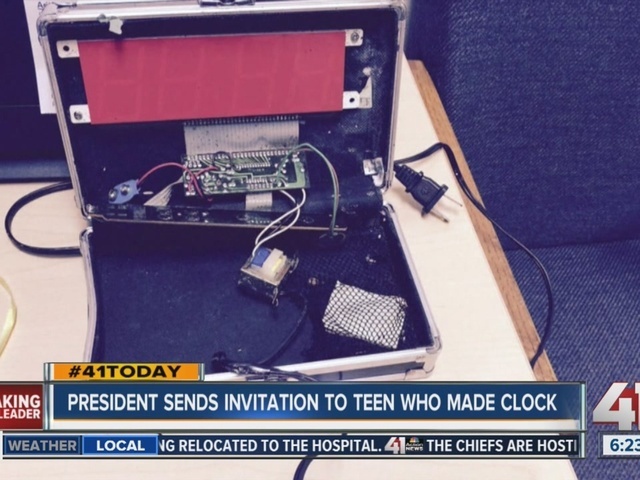 A 14-year-old Muslim boy became a sensation on social media Wednesday after word spread that he had been placed in handcuffs and suspended for coming to school with a homemade clock that teachers thought resembled a bomb. Police declined to seek any charges against Ahmed Mohamed, but his arrest and suspension ignited a wave of criticism of police and school officials and raised suspicions that they had overreacted because of the boy's religion. Ahmed said he's thinking about switching schools. "I really want to go to MIT and ... I'm thinking about transferring schools from McArthur to any other school," Ahmed said during a press conference . Ahmed was pulled from class Monday and taken to a detention center after showing the digital clock to teachers at his suburban Dallas high school. Police Chief Larry Boyd said the clock looked "suspicious in nature," but there was no evidence the boy meant to cause alarm at school. Boyd considers the case closed. "I built the clock to impress my teacher, but when I showed it to her, she thought it was a threat to her. So it was really sad she took the wrong impression of it," Ahmed said at a news conference in front of his family's home. Ahmed said he plans to transfer out of MacArthur High School. Asked what he would say to other kids who like tinkering, he replied: "Go for it! Don't let people change who you are, even if you get a consequence for it. I suggest you still show it to people, at least show them your talent." In a matter of hours, the clock made Ahmed a star on social media, with the hashtag #IStandWithAhmed tweeted more than 900,000 times by late Wednesday afternoon. Linda Moreno, an attorney representing Ahmed, said the family is considering taking legal action against police after officers interrogated, handcuffed, searched, booked and fingerprinted the teen. She would not give details on questions he was asked by police. Groups including the American Civil Liberties Union condemned what they called the school's heavy-handed tactics. "Instead of encouraging his curiosity, intellect and ability, the Irving (school district) saw fit to throw handcuffs on a frightened 14-year-old Muslim boy wearing a NASA T-shirt and then remove him from school," Terri Burke, executive director of the ACLU in Texas, said in a statement. Among those messaging their support on social media were President Barack Obama, Democratic presidential candidate Hillary Clinton and Facebook founder Mark Zuckerberg. In a tweet, Obama called Ahmed's clock "cool" and said more kids should be inspired like him to enjoy science, because "it's what makes America great." Asked if bias was involved, White House press secretary Josh Earnest said it was too early "to draw that direct assessment from here." But, he added, Ahmed's teachers had "failed him." "This is an instance where you have people who have otherwise dedicated their lives to teach our children who failed in that effort, potentially because of some things in their conscience and the power of stereotypes," he said. The boy was invited to participate in an astronomy night the White House is organizing sometime next month with premier scientists. In a post to his site, Zuckerberg said, "Having the skill and ambition to build something cool should lead to applause." "Ahmed, if you ever want to come by Facebook, I'd love to meet you," Zuckerberg posted. "Keep building." Ahmed's father, Mohamed Elhassan Mohamed, said his son is a wizard at electronics, repairing the family's clocks, phones and electricity, and Ahmed said he has built a go-kart. He said he was moved by the support for his son from across the country. School district spokeswoman Lesley Weaver declined to confirm the suspension, citing privacy laws. Weaver insisted school officials were concerned with student safety and not the boy's faith. The police chief said the reaction to the clock "would have been the same regardless" of his religion. "We live in an age where you can't take things like that to school," Boyd said. Boyd said police have an "outstanding relationship" with the Muslim community in Irving and that he would meet the boy's father Wednesday to address any concerns. This spring, the city council endorsed one of several bills under discussion in the Texas Legislature that would forbid judges from rulings based on "foreign laws" -- legislation opponents view as unnecessary and driven by anti-Muslim sentiment. Khalid Hamide, a spokesman for the mosque the family attends, appealed for politicians "to be careful with the words that they use when they refer to Muslims, because this event is not an isolated event." The Council on American-Islamic Relations is reviewing the action against Ahmed.